(Bloomberg) -- Turkish President Recep Tayyip Erdogan warned that bankers deemed responsible for creating excessive demand for hard currency and making misleading predictions on foreign exchange rates will “pay a heavy price” after next week’s elections. 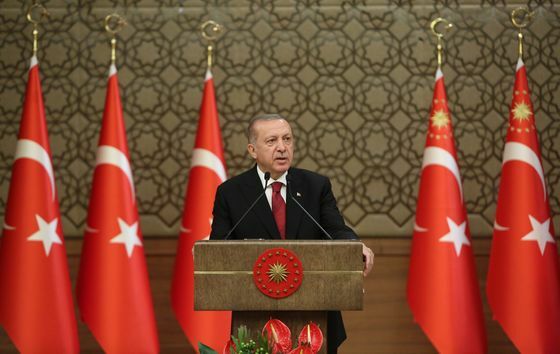 “If you are soaking up foreign currencies from the market and engaging in provocative actions,” there will be “a heavy price for that,” Erdogan said on Sunday in televised remarks during an election rally in Istanbul. Erdogan’s warning came a day after Turkey’s regulators began an investigation into JPMorgan Chase & Co. and another probe of unspecified banks for stoking for the lira’s biggest plunge since last year’s crash. Under pressure for weeks, the lira’s slump picked up pace on Friday amid speculation the decline in reserves signaled the central bank was using its holdings to prop up the currency before elections on March 31. The Turkish currency ended the day down more than 5 percent, extending its loss for the year to over 8 percent in the world’s worst performance after Argentina’s peso. The central bank’s holdings declined $6.3 billion in the two weeks through March 15, the biggest decrease in the stockpile since January 2014. Still, a central bank official said on Friday that didn’t represent any extraordinary development and mostly reflected repayments of foreign debt and sales of hard currency to state companies that purchase energy imports.